In conjunction with Malaysia Day on 16 September 2018, Malaysians are invited to spend their holiday and celebrate the spirit of Malaysia at REMPAH 2018, an inaugural celebration of unity and harmony amongst Malaysians, through what Malaysians love best: Food, Music, Arts and Crafts. REMPAH 2018 is organised by One Nation Fits All (ONFA), a community platform born out of the desire to build interconnected communities in the new Malaysia, and to create mutual improvement through social programmes and social enterprise. ONFA’s platform is all-inclusive, as no one should be left behind in the collective endeavour to build a caring, industrious world-class nation. The event is organised with the support of prominent partners such as Big Bad Wolf, BookXcess Sdn Bhd, Sunway Education Group, Balai Seni Negara, GanForHire, Tujuan Gemilang, Village Grocer and others. “On this special day, from 9.16am to 9.16pm, we are bringing together Malaysia’s artistry across many fields, assembling all this talent in one place on Malaysia Day for the various segments of Malaysian society to savour and experience. 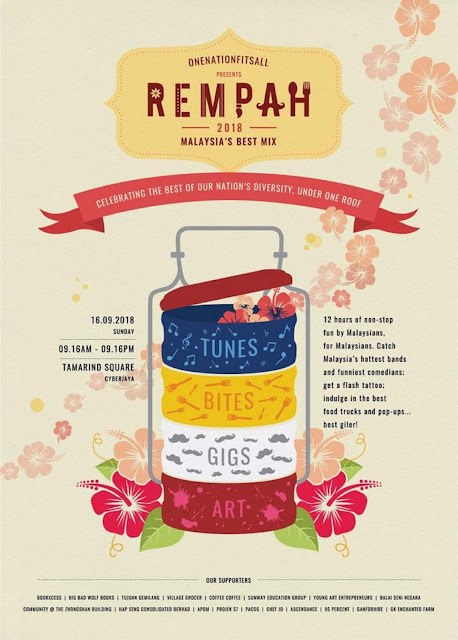 The event name REMPAH is inspired by the Malay term – Rempah Ratus, which defines the beauty and artistry of Malaysian cuisine. When cooking, we need a mixture of several rempah (spices) to achieve a delicious and flavourful dish. In life, this mixture of different elements also makes for a more vibrant and dynamic society. We hope that all Malaysians will come together like rempah in our dishes, to spice up this wonderful event and enjoy the diversity of Malaysia’s culture. After all, we are all the rempah in the beautiful recipe that creates our beloved Malaysia. We also thank all our partners for their contribution and support in bringing this event to life, thus providing Malaysians a platform to showcase their talents,” said Peter Gan, Co-Founder of One Nation Fits All. Participation at REMPAH 2018 is free for all Malaysians, as exhibitors or just as visitors. Local talents are invited to exhibit or showcase their arts and crafts at the designated areas in Tamarind Square, Cyberjaya. Members of the public will get to walk down memory lane and create new memories at the “Heritage Street” area, with its showcase of vintage decorations and items, inspired and developed by Sunway Education Group. Meanwhile, Balai Seni Negara will showcase their exhibit titled “A Place Called Home”, which depicts the lineage and history of Malaysia. Visitors at REMPAH 2018 can visit BookXcess Tamarind Square for special Malaysia Day in-store activities such as storytelling, puppetry and many more. There will also be screenings of three award-winning short films by Astro, face painting, a Baby Theatre play, flash tattoos, art installations by talented art students from Balai Seni Negara’s Young Art Entrepreneurs programme, specially choreographed performances by awesome dancers and musicians, and they can also pick up customised limited-edition bookmarks created by local watercolour artists. Children can participate in the Ejen Ali colouring contest, featuring Ejen Ali – a popular character from an animated film produced by local talents Wau Production. For the early risers and fitness buffs, make sure to come over with your family and friends to participate in the 8am wellness session, with activities such as Tai Chi, Yoga, Qi Gong and Zumba. When hunger strikes, fear not as there will be a wide variety of Malaysian dishes on offer for foodies, with some international favourites thrown in, from delectable gourmet creations by MasterChef Malaysia Juror Chef Jo, to offerings from Alice’s Bakery, Just Heavenly, Boat Noodles, Chill Chill, The Picha Project, Simple Box Food, curated Food Trucks and many more. In total, there will be more than 60 vendors showcasing their arts and crafts at REMPAH 2018, including Coffex Coffee, Chocolate Concierge, Apom, Doof, The Tiffin Company, Batik Boutique and more. For more information and live updates on REMPAH 2018, do visit our Facebook event page at https://www.facebook.com/events/884459348609878/.